Rivkin Radler has five offices and 180 lawyers on staff, making them not only the largest law firm on Long Island but one of the largest law firms in the state of New York. An award-winning law firm, Rivkin Radler is driven by its unwavering commitment to client satisfaction. 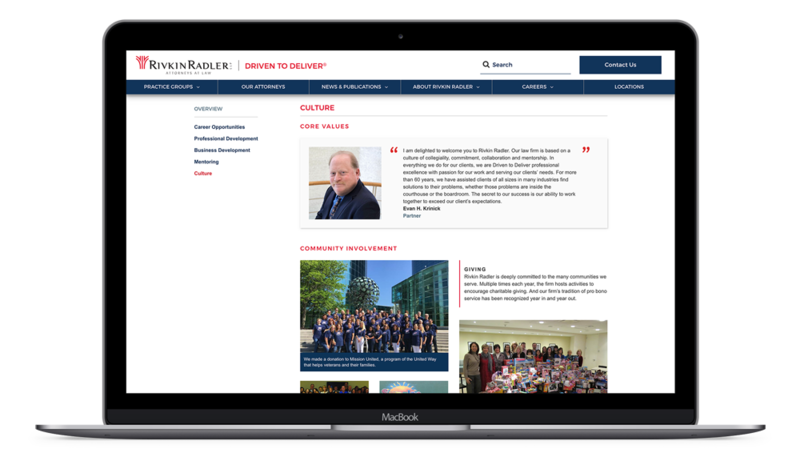 Our goal was to make Rivkin Radler's website a stronger representation of the firm they are today. We were determined to position Rivkin Radler as the powerhouse law firm that they are. The firm had recently undergone a redesign, so our teams mutually decided to optimize the website and user experience by making consistent iterative updates in phases. We enhanced Rivkin Radler’s website to represent their distinguished brand and reputation. In order to properly position this industry-leading law firm, we strengthened the user experience by restructuring the navigation to display more entry points, increasing user engagement and adding credibility to their first impression. Our team rebuilt Rivkin Radler’s attorney directory and website search, in addition to creating more actionable opportunities throughout the site to effectively guide users to their destination. The work that we’ve accomplished is a direct result of excellent collaboration between our two teams. With the support of Rivkin Radler, and the goals they've brought to the table, we've designed experiences that better serve their target audience. We’re proud to partner with such a tenacious and dedicated group of individuals. Our team continues to make the site even more engaging, informative and resourceful not only for the firm, but also for their prospective clients and employees.